More wins, more games, more water. Toronto 6ixers made hydration a team activity to beat the Cincinnati heat. The Toronto 6ixers finished off the first leg of their Club Worlds journey with two more wins, making for a total of four. The undefeated performance made them the top performer in Pool H, a cause worth celebrating, particularly after two emphatic wins over accomplished European squads. 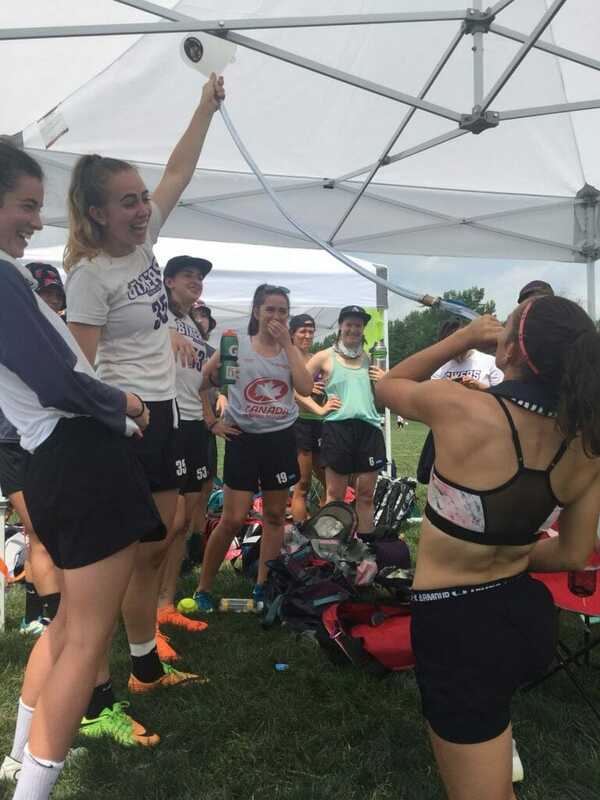 With a 15-6 victory over Mainzelmadchen (GER) and a 15-8 score against Troubles (POL), the Toronto women head into power pools with a full head of steam. Tough opponents weren’t the only obstacles for success in Lebanon, Ohio, however. Today’s conditions alternated between some blustery winds and blasting sun whenever the wind died down. The heat was brutal, the sunscreen flowing, and dehydration a constant threat. The 6ixers came prepared for making even taking on the heat as fun as their games on the pitch. “We’ve had a crazy heat wave in Toronto and we’re pretty acclimatized,” said Naomi Redmond. The team obviously has had a chance to practice harassing each other to drink more water and gotten creative with ways to get the necessary fluids. Today’s post-game antics comprised both songs and games. After their strong showing against Troubles, 6ixers entertained their new Polish friends with a catchy song. The women of Mainz offered a game of superlatives. A representative would pick a superlative, such as “Fitness Queen.” Each team member was given only a moment to decide before pointing to their personal selection. The most popular choice for the guest team was given a prize. All in all, two more wins and some shenanigans makes for a pretty good day for the young team. They’ve been hit with tough conditions in their first trip to Club Worlds. Their pool featured four teams with very different styles. That meant having to make a lot of adjustments and adaptations over the two days. And their depth has proven itself worthy in large margin victories that should have them primed for power pool success — and more antics. Comments on "Inside Break: First Timers Win Their Pool With Their Own Style"